What a ride! Coates Conservation Lands are a stunning area with a sudden deep drop to Willow Creek, amongst flat Alberta farmland. However, access to Coates has not been ideal in the past. The main trail passed through neighbouring lands and was very steep. These trails, as well as the natural riparian area at the bottom, were being degraded by frequent Off-Highway-Vehicle (OHV) use. This year, EALT has taken a number of steps to improve trail access, increase environmental health, and prevent access from damaging OHV use. 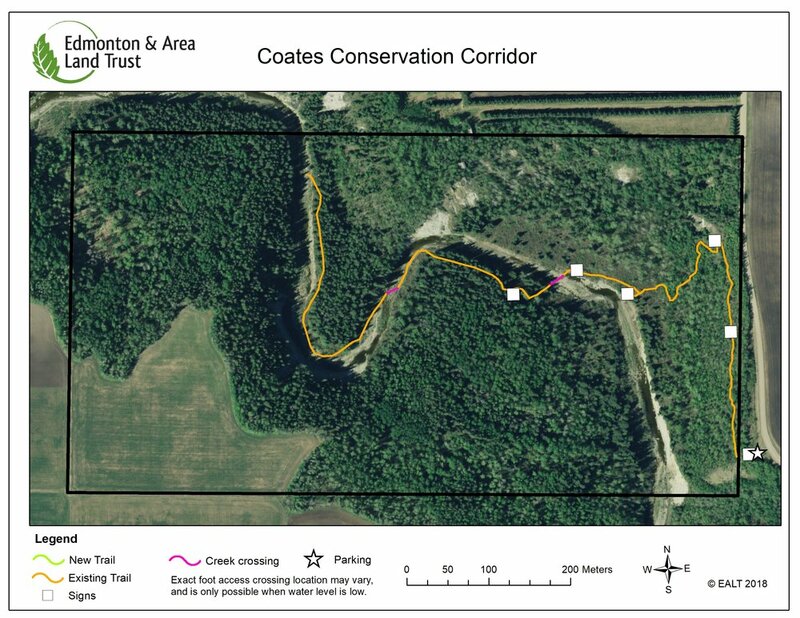 We began with construction of the new trail, which is now on our land only, ensuring Coates will always be accessible to visitors in the future. This trail winds its way towards the creek, includes gorgeous views, and is designed to have minimal impact on the environment. The trail is less steep than the original one, which not only makes it easier for visitors to maneuver but also reduces erosion on the slope and sedimentation in the creek. With the new trail cleared and leveled, we had boulders brought in to block the old and new trails from OHV access while allowing visitors to easily access the new trail. This prevents our new trail from being degraded by OHV use, and may reduce impacts in the creek if our trail is where OHV users are accessing Willow Creek. After all this construction, we wished to take further actions to ensure the trail was safe. That is where our volunteers came in! Our volunteers came in large numbers on two full, busy field days to help out. First they installed 30 steps on the new trail and reclaimed the old trail with coconut matting and logs, giving it a chance to recover. Coconut matting will slow erosion and help plants to re-establish. On a second field day, our volunteers installed another 30 steps (with snow all around them!) and also installed 4 educational signs to help visitors learn about the area. Finally, staff finished up the trail with the installation of a ladder to scale a sharp drop at the creek, and installed a sign to educate OHV users near the water. We can now declare this trail complete. At the end of September, we held a Grand Opening event, where the Mayor of Leduc County, Tanni Doblanko, installed a chickadee nest box to officially open the area. Come and see it for yourselves! Visit our website for directions, a trail map, and a self-guided tour booklet.